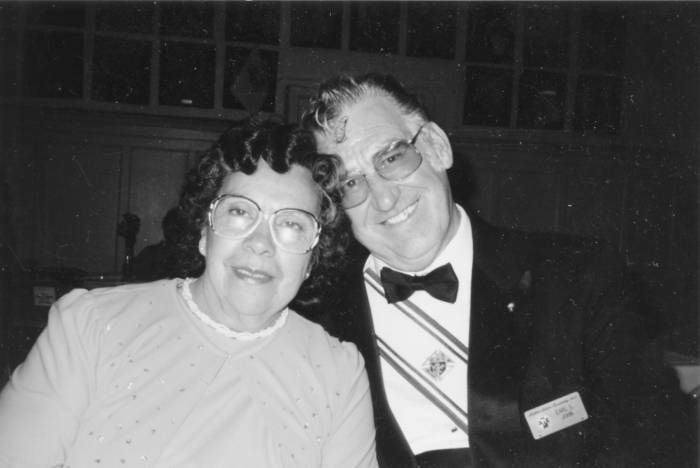 Biography - John, Earl S.
I would like to tell you a story about Earl Severen John. He was born on Jan. 8, 1927 and died on Jan. 29, 2006. Dad was born in Palisade, CO to Carl and Bessie John. He had two brothers, Vernon who is no longer with us, and Clarence who lives in Oregon. Dad dropped out of school in the 8th grade and went straight to work. So with wife in hand and the Model T packed up, they moved to Dillon. Here dad got a job on the railroad. After a short stay in Dillon they packed up again and moved to Denver renting a little house on Vine Street, later moving to Pearl Street. Their little house was small, but home. Soon David was born. During this time dad got a job at Gates Rubber Company and mom started cleaning houses. Before they knew Fred was born. Their little house was too little. This is when they moved to Sheridan and bought their first house in 1961. With two boys in school, dad now working at Home Lumber building stairs, and Mom still cleaning houses, here is where I come in. I'm the baby, Jessica. 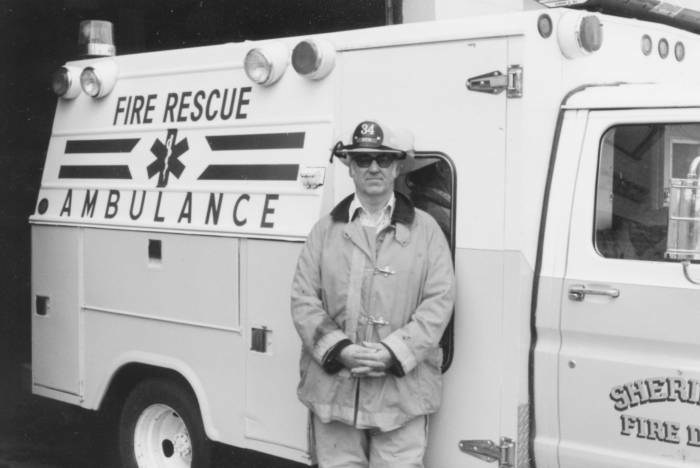 Dad loved his community so much that he became a volunteer fireman for Sheridan. I can remember him dressing up as Santa and handing out presents to the kids and to nursing homes. Dad went door to door selling bingo tickets. We had a freezer full of turkeys and hams. He was always the top seller and we were sick of bird and pig. Dad was always ready for a fire call. Boots and pants by the front door, and that stupid coffee can on the top of his truck that covered the light. I have fond memories of the fire department. Parties in the park, fireman's field days, great food, the games, and the laughter. They were all his family. He loved everyone in the department. Dad was also a life member of the VFW In Sheridan. He also joined the Knights of Columbus. Mom and Dad had been members of Holy Name Catholic Church since moving to Sheridan. Dad enjoyed the meetings, dinners and the parties. He was at all the fund-raisers, volunteering for the tootsie-roll drive, can drive and the paper drive. In fact when dad had his open heart surgery it wasn't long before he was out there volunteering again. When Dad retired from Home Lumber and the Fire Department he got bored, so he got a part time job at Sam's Club. At first he was a door greeter, but standing still his knees started to hurt, so he went to stocking the milk. After awhile his legs just couldn't handle the cement floor and he had to quit. Dad did what he could, but time, diabetes and dementia started to take its toll. Little by little he started to slow down. He stopped driving and events became limited. On May 23, 2005 he had a toe removed from his left foot and then on Nov. 1 the leg was removed just above the knee. After that he had no pain but his health went downhill. We are thankful that we had him for the holidays and his birthday. Dad went quickly in his sleep. He is survived by his wife of 57 years, Helen; son David (Kandy); son Fred (Sheri); daughter Jessica; grandchildren Jeremy (Nikki); Niki (Brian); Kaylee; great grandchildren Mason; Talon; Cody and Devlynn. Thank you daddy for being you and teaching us to care for others. Love Jessica. We would like to thank everyone that knew and loved my father. Especially the Cherrylyn Care Center and Hospice of Porter. They loved my father almost as much as his own family. Internment was Feb. 2  at Fort Logan Cemetery. Copyright &COPY; 2006 by the "Denver Herald Dispatch & Sheridan Sun"
All rights reserved. Original publication: February 16, 2006. Note: The newspaper does not maintain a web presence. "Denver Herald Dispatch & Sheridan Sun"
Republished: October 1, 2006 by the Sheridan Historical Society, Inc.
with permission from the "Denver Herald Dispatch & Sheridan Sun."